Attention all students and staff: the Student-Faculty basketball game is this Friday March 3rd. Great job yesterday with the beginning of spirit week and color wars! Today is twin day and tomorrow is Neon Day – if it ain’t neon, it shouldn’t be on! Additionally, tickets for the game will be on sale in the cafeteria all week – single tickets are $5 and family tickets are $10. You can also purchase tickets at the door on Friday. Throughout this week, we will be holding a fundraiser called Pie Wars! Pie Wars is a charity fundraiser for two important charities: Muscular Dystrophy Parent Project and Special Olympics! What each grade has to do is simple! We will be selling tickets for one dollar each! When you buy a ticket for $1, you put your name on it for a chance to be one of the three lucky winners The grade that buys the most tickets is the “winning grade.” Three students will be randomly chosen from that grade to be given the opportunity to throw a pie at their principal’s face! This event will be held at the Student Faculty Basketball Game at the halftime show on Friday March 3rd! We will announce the three students chosen on Friday! Winners can get free tickets to the basketball game as well! If you cannot attend the Student Faculty Basketball Game and you are chosen, you have the chance to give away your ticket, or ask for another student to be chosen, but please inform your principal if you are chosen and you cannot attend. Our goal is 1000 dollars! Thanks KMS! Recently, you may have heard a lot of announcements about the “ What’s So Cool About Manufacturing Student Video Contest. Maybe it’s time to explain: 5 KMS students along with teams of students from 13 local middle schools traveled to local manufacturing facilities to create a two minute video that captures “What’s So Cool” about careers in Advanced Manufacturing. This contest generates awareness of what an advanced manufacturing career may look like to our younger, tech savvy generation. Attention all girls planning to play lacrosse this spring – There will be informational meetings this Wednesday, March 1st. The meetings will be quick but important information about the upcoming season will be distributed. 7th graders should stop by C103 to see Ms. Frattura before heading to 1st period. 8th graders should stop by A101 for the first 5 minutes of lunch. Check in with your coach if you cannot attend the meeting. FCA Huddle this Thursday morning at 6:50am in Mr Bowling’s room. Come for the donuts! Everyone is welcome. Attention Mr. Fox’s Grade 8 Computer Classes: Please Bring your High School Educational Planning Guide and Scheduling Worksheet to your next Computer Class. That’s for Mr. Fox’s Grade 8 Computer Classes. Students who don’t have computer class will be meeting 1st period today to schedule high school classes. Tryouts for 7th Grade boys’ baseball will be held on March 8th, 9th and 10th. If you are interested sign up with Mr. Augustine at lunch on Wednesday. Attention all students and staff: The student-faculty basketball game is this Friday March 3rd. This week is spirit week in anticipation of the Student-Faculty Basketball game on Friday. Today is color wars and tomorrow is twin day. Pick a friend or group of friends and dress in your best twin outfits! Let’s get online and vote for KMS. Log onto dreamitdoitpa.com. Please go and vote. KMS deserve a win! Again, dreamitdoitpa.com. Students in all grades make sure you are returning your conference paper to your LEAD teacher. It is imperative that you get them turned in as soon as possible. Attention Mr. Fox’s Grade 8 Computer Classes: Please Bring your High School Educational Planning Guide and Scheduling Worksheet to your next Computer Class. That’s for Mr. Fox’s Grade 8 Computer Classes. Students who don’t have computer class will be meeting 1st period tomorrow to schedule high school classes. Check with Mrs. Stoudemire at lunch today with any questions. Attention all students and faculty: The student-faculty basketball game is next Friday March 3rd. To get everyone pumped up for the game, Student Council has planned a spirit week. Monday will be color wars – each grade wears a different color and competes for the most participation. 8th grade will be wearing black, 7th grade will be wearing red, and 6thgrade will be wearing purple. Start planning your outfits now! Congratulations to our own KMS Treble Choir members, Pattie Mancuso, and our entire music department for an awesome performance of the National Anthem at tonight’s Temple vs University of Central Florida men’s basketball game. There is a lot of Kennett PRIDE at the Liacouras Center tonight! Here is a glimpse of how fabulous they sounded. 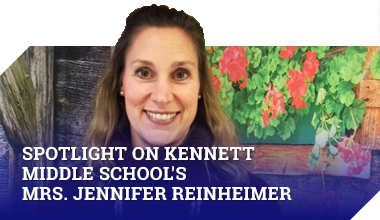 On Tuesday, March 14, 2017 Join us to celebrate Kennett Middle School’s participation in this contest! Awards for Outstanding Editing, Outstanding Videography, Outstanding Cool, Outstanding Educational Value, Outstanding Creativity and Viewer’s Choice will be presented at the ceremony – come show your Kennett Pride and cheer for fellow students! A Manufacturer Expo will be included in the event to showcase the participating companies and fabulous desserts will be served. You will see the event flyer hanging outside of Mr. Malkasian and Mr. Powell’s room if you’re interested. Lastly, to our 5 participating students, please see Mr. Powell or Mr. Malkasian immediately regarding your attendance at the award ceremony. Reminder: For all girls interested in the softball team, there will be an optional open hitting session at the KAU shed this Friday from 3-5PM. Bring your bats and helmets and catchers bring your gear. Everyone must arrange for their own transportation to and from the KAU shed. For more details, please see the flyer posted outside Ms. Gottstein’s room. A big congratulations to sixth-grader, Blake Ciresa, for representing Kennett Middle School like a champ yesterday at the Chester County Spelling Bee! She was one of 51 spellers from throughout the county. Blake made it through the preliminary rounds into the championship rounds. She spelled with great concentration and poise, and we are so very proud of her. I’m sure we’ll see Blake again next year at the KMS Bee. Well done, Blake! 7th and 8th grade Students who plan to try out for Baseball, Lacrosse, Softball or Track – Please check the board outside of the Cafeteria to make sure your name is listed under the appropriate sport. You must have written parent consents and sports physical to be cleared for try outs. If your name is not on these lists, see Mrs. Shannon in the nurse’s office today. Students in all grades should return their Conference Inquiry Form to their LEAD teacher as soon as possible. Many of you do not see your darling LEAD teacher every day, please seek out that teacher and hand in your form. There is a KMS Dance tonight from 7:00pm-9:00pm. It is for KMS students only. $1 from each ticket sale will go the KHS Mini Thon. Please inform your parents that the pick up time is 9:00pm. Attention all students who signed up for today’s Lunch n’ Learns: You will receive a pass during homeroom today. Use this pass to get your lunch five minutes early. Bring your lunch to the room designated on your pass. We will learn about careers in financial management from our special guest. Attention all students and faculty members: it’s that time of year again! The Student-Faculty Basketball Game is next Friday, March 3rd. To get pumped up for the game, Student Council has planned a spirit week for next week. Monday will be Color Wars, Tuesday will be Twin Day, Wednesday will be Neon Day, Thursday will be Dress Like a Teacher Day, and Friday will be a KMS Pride Blue and White Day. Start planning your outfits now! Congratulations to our own KMS Treble Choir members, Mrs. Mancuso, and our entire music department for an awesome performance of the National Anthem at tonight’s Temple vs University of Central Florida men’s basketball game. There is a lot of Kennett PRIDE at the Liacouras Center tonight! Stay tuned tomorrow to see a glimpse of how fabulous they sounded. Attention 8th grade students many of you have done your course selections in computer class. As you go to that class make sure you take your selection materials. Mrs. Stoudemire says you can jump on when you would like. Please stay tuned for a video on This day in History Thursday. Today Blake Ciresa, a sixth grader here at KMS, is representing our school at the Chester County Spelling Bee in Downingtown. Please send Blake happy thoughts! On a related note, all students who participated in the KMS Spelling Bee will be receiving certificates at an upcoming school assembly. Thank you again to all our spellers, and we’re wishing Blake the best! Attention Treble Choir members: 8th graders are dismissing at noon today. 7th graders are dismissing from lunch at 12:15. Please gather ALL of your belongings and report to F105 as quickly as possible. See Mrs. Mancuso with any questions. Attention What’s Cool about Manufacturing team. There will be a pizza party to celebrate your success next Tuesday Feb 21st in F-111, Mr. Malkasian’s room. Please stay tuned for a video about the KHS mini thon which takes place this Friday at KHS. This Thursday Ms. Tomaino and Mrs. McGarvey will be hosting a special lunch for 6th, 7th, and 8th grade girls. During this lunch we will be introducing Engineering opportunities for girls and exploring more about the FUN side of Engineering. If you are interested in joining this lunch special, please sign up outside of Ms. Tomaino’s room or by the guidance offices. But hurry! Limited spots available! Attention 8th Grade Basketball Teams: This is your friendly reminder to turn in your completed permission form to play in the Student-Faculty Basketball game to Mrs. Bevan today, Friday, February 17, 2017. Please stay tuned for a video about the KHS mini thon. “Next week is ‘National Engineers Week’, selected by the National Society of Professional Engineers. Here at Kennett Middle School we will be celebrating by engaging in feature lessons in our STEM classes! If you are looking for more opportunities to get to know engineering, you are welcome to come by each day to the STEM classrooms for lunch! Today is the last boys basketball game and the cheerleaders last home game too. If you want to stop by and support them make sure you stay in the gym and show your Kennett Pride. Attention 8th Grade~ If you are not currently enrolled in a Computer Class, and did not have a time to sign the list during lunch on Monday, please stop by the Guidance Office to see Mrs. Stoudemire sometime today so you do not miss out on the high school elective scheduling process! Looking ahead to the upcoming schedule we have no school on Monday Feb 20th as we celebrate Presidents Day. Then next week on Wednesday grades are pulled for progress reports. That’s Wednesday, February 22nd, progress reports for the 3rd marking period. TIme is flying. ATTENTION BYE BYE BIRDIE COMPANY: TODAY’S REHEARSAL IS CANCELLED. THERE WILL BE NO MUSICAL REHEARSAL TODAY AFTER SCHOOL. PLEASE GO HOME ON THE BUS. THE PARENT MEETING WILL STILL TAKE PLACE TONIGHT AT 6:30. TODAY’S BYE BYE BIRDIE REHEARSAL IS CANCELLED TODAY. PLEASE GO HOME ON THE BUS. FCA huddle will be this Thursday morning at 6:50 in mr Bowlings room. Breakfast will be served. Bring a friend.